The F.Y.E “I.M.P.A.C.T” Student Club, a branch of the First Year Experience program, is a stepping-stone for first-year students as they embark on their academic journey. The club shows students that there is more to college than just attending class and going home, but that there is student life on campus. The program is yearlong, and with each semester students are a part of a learning community where they develop professional skills that will help them succeed in college as well as in the future. Students also experience a career development courses that help them discover their career path in life. The club aims to show students that there is more to college than just attending class and going home, but that there is student life on campus. In our club, students network, develop leadership skills, empower themselves, do community service, get active on campus, and make connections with students and faculty all over campus. The F.Y.E. 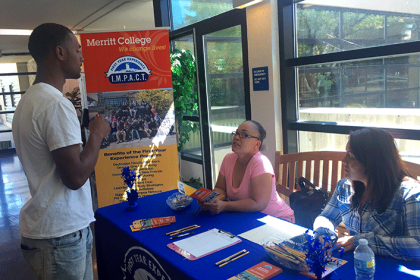 “I.MP.A.C.T” Student Club collaborates with Student Activities, the Inter-Club Council, (I.C.C. ), and students clubs on campus to coordinate events and engage students from diverse backgrounds to be integrated in the community college system. Join our club! Our meetings are held on Tuesdays from 12:30 to 2:30 p.m. in the Chambers, R-127.